The next day, Monday, was my LAST DAY in Moscow, and I still had not gone to the Kremlin OR the Matrushka Doll Museum, but meanwhile I was scheduled to be back at The Jewish Agency in the afternoon for some meetings. I needed to make the morning COUNT. I looked at a map and decided to take a taxi to the Doll Museum first, since it was way out of the way, to the east. Then I would take another taxi westward to the Kremlin, do a brief walk-around there, and then walk to The Jewish Agency. The hotel called a taxi for me and told the driver to take me to the address that was given in my guide book. Yay! 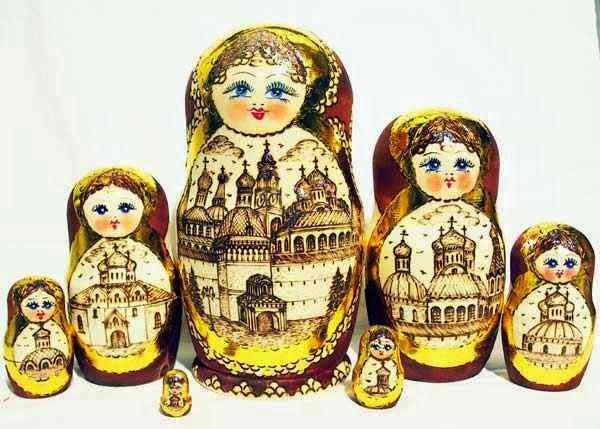 Matrushka Dolls! The taxi pulled up to a very handsome building, I paid him, and I walked happily to the door. On it was a sign that said the museum had moved, to a place completely across town. There was nothing for me to do but laugh. So I laughed and laughed and laughed until I was almost crying. Most people don’t realize that The Jewish Agency is involved in a lot more than “just” immigration to Israel. Among lots of other things, the Sochnut, as it’s known in Hebrew, has a hand in an incredible variety and scope of Jewish education programs around the world, especially in the former Soviet Union and South America. There are children in the former Soviet Union whose ONLY Jewish education comes from Jewish Agency programs. In Russia, as in most of the world, Sunday is not a standard workday, and so The Jewish Agency facility – classrooms, offices, an auditorium – are busy with all sorts of formal and informal Jewish education programs, which generally draw those Russians who either are planning to move to Israel, or who simply want to learn more about Jewish heritage or Hebrew language, but aren’t necessarily interested in the religious nature of the education offered by the local, mainstream Chabad. The Jewish education offered by The Agency frames the material in terms of history and culture rather than “Jewish law,” and many participants, such as campers in Jewish Agency camps, decide to, for example, start lighting Shabbat candles and making Kiddush at home not because they necessarily believe God commands it, but because it is a beautiful Jewish thing to do that is part of our history and part of what connects us to each other. For some there is a spiritual aspect as well – or perhaps, feeling part of a community and feeling spiritual, for many people, is the same thing. For my job as a marketing writer for the Sochnut, I write about those programs all the time; what a thrill to finally see them in action and meet the people who make them happen! And, once again – what a miracle that Jewish education was happening in the open, in Moscow! A miracle! * Hebrew-language “ulpan” classes for adults, at different levels. * A class on Hebrew, Israeli history, and math, for high school kids preparing to take the entrance exam for Na’ale (a program through which they attend Israeli high schools for grades 10-12). *A session of the year-long training for counselors who work at Jewish Agency camps. Their course includes both Jewish education for themselves, and lessons in pedagogy and program planning. On this particular day they were studying the "motivation" element of programs - how to start things so the children are interested in participating. 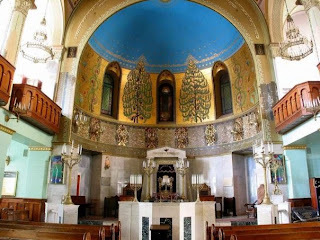 All that, punctuated by lunch across the street at the historic, stunning ChoralSynagogue. The synagogue is magnificent, and has an absolutely beautiful restaurant (with English menus!) on the second floor. A kosher restaurant in Moscow! A miracle! Sunday morning shone bright and cold, and I was ready to see the Kremlin! My feet still hurt real bad in those boots, and because of the toe I’d squashed at the Jewish Museum, but I hardly felt sick anymore at all, I had money in my wallet, and I was on my way! I looked carefully at the maps and saw that if I got off the subway at the “Biblioteka” stop, I could then walk through the Kremlin and Red Square at my leisure, and continue on eastward toward the offices of The Jewish Agency, where I was expected at noon. Those of you who have been to the Kremlin already know that this is impossible: the Kremlin is a complex of buildings surrounded by a wall, and there is only one way to get in or out, through the gates on the Western side. But I didn’t know that. I got out of the subway and noted that this stop had a few cute little shops in it, including a gift store with some nice matrushka dolls in the window. Since it’s so cold outside in the winter, Russians do a lot of their shopping underground. I wondered what the dolls would look like at the Matrushka Doll Museum tomorrow! I walked toward the Kremlin and was stopped by a guard, who said I needed a ticket. Oh, duh! That makes sense! At last, a bit of capitalism around here! I was directed to walk a bit more, lots of painful steps, to check my backpack. At this point, my memories are dim. I remember that I tried to explain in English to the bag check lady that I need my bag, because I’m not coming back out this way, I’m going THROUGH the Kremlin and won’t be returning here to get my bag. She, of course, had no idea what I was talking about, because – as I now know – it’s impossible to go THROUGH the Kremlin. Thwarted in my attempt to enter – because really, the security guard doesn’t let in anyone with a backpack, which I understand – I now had, once again, failed in my plans AND, to add insult to injury, had to now walk AROUND the Kremlin to get to The Jewish Agency. That was cool. I mean, seriously, if you are going to fly to Moscow and get sick and not have money and then not be able to get into the Kremlin, at least there are soldiers in those coats, doing that march! Shabbat ended, and it was time to get money! I was so scared something would go wrong – the PIN wouldn't work, or something else – that I delayed finding out by first going back to the supermarket to finally get the banana that I hadn't been able to purchase the first time. If I was going to be in deep trouble, alone in Russia with no money, at least I should have a banana for strength! One specific thing that terrified me was the suspicion that once I took money out of an ATM using my new card, when my Israeli credit card company saw that someone was using the card in Russia, they might cancel the card. So after the supermarket, I nervously approached the ATM machine in the lobby of my hotel, with the goal of taking out, all at once, more than enough to cover the rest of my trip which, in addition to two days of visiting the offices of The Jewish Agency, would include: paying back Rusina; a little touring; a meal or two at kosher restaurants; a few Matrushka dolls; money for a cab back to the airport; and money to spare, just in case. The ATM had a limit of 5,000 rubles (500 shekels, or around $140) per transaction. In a panic about having the card canceled, I made 4 withdrawals, one immediately after the other, for a total of 20,000 rubles. I couldn't REALLY afford to spend the equivalent of 2,000 shekels on my vacation, but the idea of spending ANY more time in Russia without access to money was spooking me. Each time those 5,000 rubles came out of that machine, I can't tell you how relieved I was. I gave 10 rubles to the receptionist to pay for the internet they'd given me for free on my first day, then went back up to my room and divided the cash into separate bundles, one for Rusina, one for dolls from the Matrushka museum, one for the cab ride to the airport, etc, to make sure I stayed on budget and would be able to make it home! I was feeling physically better, and I had 20,000 rubles in my wallet to enjoy – this vacation was getting back on track! I was leaving Tuesday morning, so I had two days left to tour – but also had meetings scheduled at The Jewish Agency. So I needed to plan carefully how to see the Kremlin AND the Matrushka Doll Museum AND get to The Jewish Agency for my meetings. Unfortunately there was just no time to see any other sites, including the beautiful subway stations that I'd so much wanted to see. At least I'd gotten to see the incredible Bolshoi (as awful as it was, for me), and the amazing Jewish Museum. Since the Matrushka Doll museum was out of the way, and I needed to be at The Jewish Agency office by noon, I decided to leave the museum for Monday so I wouldn't be late to work. Sunday: Take the subway to the Kremlin, walk through the Kremlin and Red Square to The Jewish Agency, which is on the other side. That way, I could sort of tour the Kremlin and Red Square while on the way. Jewish Agency meetings from noon until 8 pm. Meet Golda Leah for dinner. Monday: Matrushka Doll Museum, then more meetings at The Jewish Agency in the afternoon. In typical Chabad style, the prayer services on Saturday morning started at 10 am (very late by most standards). I showed up at noon, and they were still at Torah reading (that is, about halfway through the service). I was glad I'd slept in! There was a bar mitzvah that morning, and at the end of Torah reading the women in the balcony threw down candies at the bar mitzvah boy. I felt happy and proud that I was raised to be able to follow an Orthodox service, and could walk into any synagogue, even in a place as "random" (to me) as Moscow, and follow along. After the service, everyone who was staying for lunch went down to the same side room where the English-language meal had taken place the night before. It was a much smaller crowd this time. Although their doors were just as "open to all" as they'd been the night before, in practice the only people who normally bother to go to the Shabbat morning service are people who have a certain commitment to Orthodox Judaism. Additionally, it seems that the elderly tend to go to bed early on Friday nights, but make sure to attend synagogue in the morning. So it was a much smaller and much older group of people this time. Additionally, unlike the night before when everyone sat where they wished and the presiding "shluchim" had everyone introduce themselves, at this lunch meal the men and women sat at different tables, and the entire "program" for the meal was one rabbi after another giving divrei Torah (sermons) – in Russian, naturally. I felt like Friday night was all about Chabad doing outreach, and Saturday lunch was Chabad being themselves – which is fine, but it didn't feel as exciting as the night before. I was very grateful to once again be getting a free, hot, kosher meal, but a bit sad not to have much of a chance to talk to the people around me. Even when there were breaks in the sermons, the elderly women did not seem talkative, and anyway the language barrier was a problem. However, I did meet three very nice women who were younger (20's? 30's? one was divorced with a child – I think she was maybe in her early to mid 30's): Miriam, Golda Leah, and Lilli. Lilli was a bit withdrawn, but Miriam and Golda Leah were thrilled to be meeting someone who lives in Israel (Golda Leah had lived in Israel for a year, and misses it badly) and to practice their English. I told them how to find me on Facebook, and we made tentative plans to get together again before I left the country. One interesting thing I discovered was that many of the regulars at this synagogue had never been given Hebrew names by their parents, and so when they decided to become more involved with Judaism, they asked the rabbi of the synagogue to choose a name for them. Apparently he was partial to the name "Miriam," because I'd met two women who got that name through him. This Miriam told me that at work she goes by her birth name, Mariya, but in the Jewish community she goes by Miriam. After lunch I went home and slept some more, desperately willing myself to recover, physically, from whatever had disabled me as I left Ben Gurion airport. I also had another concern: yes, I now had the PIN code to my credit card, but what if something else went wrong with it? What if it didn't work? When I went downstairs, I found that the auditorium was set up with multiple tables, open to anyone who wanted to partake of Shabbat dinner at the synagogue. It appeared that there was a table for Hebrew speakers (the "Israelis in Moscow" group that I'd found on Facebook), a table for younger people, a table for retirees, etc. Once every three weeks, there is a table for English-speakers, and I happened to be there at the right time. I entered the room on the side where the English meal would take place. The meal was presided-over by a young American rabbi and his Italian wife, both Chabad "shluchim" (emissaries) in Moscow. Every third week they got a babysitter for their kids on Friday night, so they could run this English-language meal. They were extremely friendly and approachable, and set a happy, hospitable tone to the meal. The one large table was shaped like a capital "T", and I sat at one end. I just want to say here that the food was MUCH fancier than I expected. I expected a more mass-produced, Ashkenazi-kiddush feeling of soggy potato kugel, gefilte fish from a jar, that sort of thing - typical beige food. But the first course was a fancy fish salad and lots of vegetable dishes. There was lots of "color" on the plate. The first course was so nice that I worried that this was it, the whole meal, and that there would be no roast chicken. But the roast chicken DID come and I was happy. The rabbi and rebbetzin had each person introduce himself or herself, and explain what they were doing in Moscow. Additionally, I got to know the married couple on my right, and the couple who had brought their friend, to my left. It was a bit sad for me, when they asked me how my trip was going, not to be able to say "it's going great." Having to say "actually, so far, it's been terrible" is very sad. But there was a certain relief for me of being out with people, feeling nominally better, and having hot food. There were people who had first come to Moscow to study or work, and had fallen in love with the city and decided to stay. There were people who came to study or work and had married a Russian and stayed for them. There were tourists, such as myself, who were just passing through. One tourist, on a business trip, was at her first-ever Shabbat meal in her life, brought to Chabad by one of her work colleagues. One man – the only other person at the meal who was Shomer Shabbat, other than myself and the rabbi and rebbetzin -- was a native Russian who simply liked to meet new people and practice his English, so he ate at the English-language meal. Quite a hodgepodge of personalities, but all with a positive vibe. To my right sat a very handsome, friendly couple who were "regulars" at the English meals; she is a native Latvian, and he is an Israeli who, it transpired, hates other Israelis. He was so happy living in Moscow and NOT Israel. That's why they were at the English table and not the Hebrew one; he hates other people who speak Hebrew. I decided that I don't need to understand other people to accept them as they are, and refrained from asking him what the hell is his problem and how he could possibly enjoy living in this ugly, formerly-Soviet city more than Israel. If he's happy – well, whatever! To my left was another handsome couple. I don't remember their story, only that they, too, were "regulars." Between us was their friend Christo, who was sitting to my immediate left. Christo is a native of South Africa who is great at languages and a world traveler, and is now in Moscow teaching English and enjoying Moscow's underground gay scene. His friends had been telling him for years that he should come to Chabad with them, and this was, finally, his first time there. And yes, he knows it's ironic for a person with a Jewish mom to be named Christo, but such is life. Christo and I are still chummy on Facebook, and meeting him was one of the most fun things that came out of my trip. After the meal ended I stayed with a bunch of the other attendees to keep "schmoozing," and I got to my hotel around midnight. The meal had been a very positive experience and is now one of my favorite memories of my time in Moscow. Click here for Parts I, II, III, IV, V, VI, VII,VIII, IX, X, XI, XII, XIII, XIV, XV, XVI and XVII. The Marina Roscha Jewish Center is simply huge. 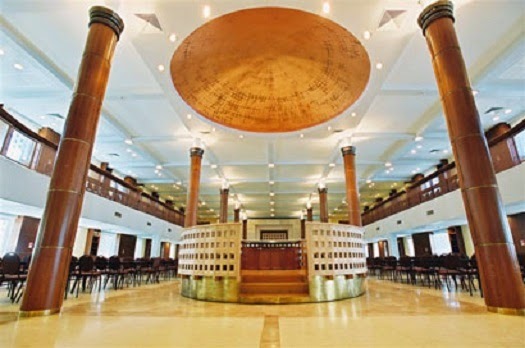 The building in which the synagogue is located contains not only the tremendous, grand sanctuary but also a library, classrooms, and a Judaica store. The Center also includes multiple other buildings, including a Chessed (Jewish Welfare) building, an elementary school, and girls’ and boys’ high schools. And there are other synagogues around the city! Wow. The women’s section is a U-shaped balcony. It turns out that that though Shabbat started at about 6:40, we wouldn’t be starting Kabbalat Shabbat (the Friday night prayer service) until 8 pm! So much for missing part of davening! Meanwhile, there was nothing to do but observe the people. Downstairs in the men’s section, which seats, I believe, about 300 people (maybe more? ), a few dozen men were sitting in various pews, reading or talking. In the back, at a long table, a rabbi was giving a shiur to about 50 men. At first there were only a handful of women -- I guess most women in the community know not to come until later -- but eventually there were, I estimated, about 70 women in attendance (indeed, dressed to the nines) and about 200 men. Despite the fact that this was a tremendous Chabad institution, it had a Young Israel vibe, with the kids running around, bored women in the back shmoozing, men in the back shmoozing, etc. I suppose once Orthodox Judaism reaches a critical mass of mainstream institutionalization, it starts to look the same no matter who is running it. All the books’ translations were in Russian, and announcements were in Russian. No surprise there, but it meant there wasn’t much for me to read or do while I waited. I was worn out and very thirsty. There weren’t many people who could talk to me because of the language barrier, and I started getting bored. As time continued passing and the shiur downstairs didn’t finish, I thought of just going home, but . . . . There would be chicken. I finally went in search of a cup of water, and was so desperate that I took a used plastic cup from a table in the back of the women’s section and just rinsed it off to use it. Desperate times call for desperate measures. At first no one spoke to me, but eventually I managed a stilted mostly-English conversation with a woman who said she works in finance, and after a traumatic life event a few months ago, she decided to look into religion and has been coming to Chabad every night for three months, and also attends a class during the week. I mentally divided the congregants into three categories: Lubavitch chassidim (I later found out that about 100 shluchim and their families live in Moscow. They hail from all over the world, and some are from Russia itself); “knowledgable about Judaism Russians” -- people who didn’t look chassidic but clearly had been attending synagogue here for many years and felt at home both with the community and with the rituals; and “not knowledgable about Judaism Russians,” people who were at their first service, or their 10th, or maybe their 20th, who were at various stages of familiarity with the prayer books. I liked this a lot, that all these people were praying at the same place. Then the services started, and I was so happy I’d stayed. Directly below me somewhere was a LARGE group of children who recited the prayers with great gusto, in unison. I was moved by this -- Jewish children, praying together in public in Moscow, with raised voices. A miracle! Finally the services ended and we all wound down the stairs to the ground floor where multiple tables were laid out for the Friday night meal. I asked around and found that the “English-language” meal was in “the restaurant,” an enclosed room on the side. So that’s where I went for my Friday night Shabbat meal experience in Moscow, so happy that I was about to get my chicken, and a bit nervous and curious about who I might meet at this meal. Click here for Parts I, II, III, IV, V, VI, VII,VIII, IX, X, XI, XII, XIII, XIV, XV and XVI. As I neared the Jewish Center, I must have turned left a little too early, and got a little lost. Where the Center was supposed to be was an entrance to a place that looked like it might be what I wanted: there was a guard outside (common to Jewish institutions in places with lots of anti-Semitism), and I saw a man in a black hat walk inside. But when I asked for "Marina Roscha" and "Rabbi Friedman," the guard didn't seem to know what I was talking about – or perhaps he just didn't understand what I was saying. Looking back, I'm thinking that perhaps this place had some sort of small, private congregation inside, but it wasn't the place I was looking for. Thanks to my work, I know a little bit about Russian-Jewish history and culture. Not a lot, mind you, but a bit. During the 70 years of the Soviet regime, no one was allowed to practice religion in Russia. Jews were arrested if they taught Judaism or attempted to engage in any communal rituals. So a lot of knowledge was lost over the generations. By the time Communism fell, most Jews in Russia had nothing positive with which to associate Jewishness. To them, being Jewish just meant that your grandparents were Holocaust survivors, and that you lived with a stigma. Being a Jew wasn't information one volunteered to neighbors. It was more an unfortunate fact of life than something to be proud of. After the fall of the Soviet Union, large Jewish organizations such as Chabbad, the Jewish Agency, ORT and others set up house in Moscow and other formerly-Soviet areas and started teaching Jewish history and heritage. A lot of Jews from Russia took the opportunity to move to Israel, but today there are something like 800,000 Jews who still remain in the former Soviet Union. In Moscow, there has been something of a Jewish Renaissance: several Jewish day schools, several synagogues, a few kosher restaurants, a kosher market, a yeshiva, a seminary . . . it's now possible to live a full Jewish life in Moscow. Photo for illustrative purposes, taken from vosizneias.com through Google Images. But it's a community going through a lot of changes very fast. You have a lot of Jews who have no interest in Judaism whatsoever, and many who are curious and will do things like go to classes at Chabad to learn what they can. They may or may not take on Jewish practice, at a rate comfortable for them. In places where Orthodox Judaism has enough of a core, "mainstream" group of adherents to comprise its own subculture – places like Boston, New York, and certainly Jerusalem, all the places I've ever lived – there's a certain assumption that for a person interested in living a life of Orthodox practice, certain rituals or practices come before others. 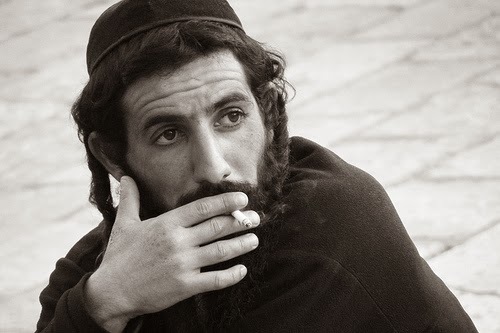 For example, a person who makes public statements about their Orthodoxy by wearing tzitzit would never be smoking after sundown on Friday night. If you are "religious enough" to be wearing tzitzit, which is a very public statement, obviously you must be fully Sabbath-observant. So I completely understood how it could be that a man in a kippah, with tzitzit swinging side to side, might be smoking on Shabbat. But it still felt strange to see, I have to admit. Anyway, we got to the Jewish Center, and I checked my coat (a shule with a coat check!) and with simple English and gesticulating managed to find out that the entrance to the men’s section was one flight up, and the entrance to the women’s was two flights up. On each landing were groups of kids wearing Shabbat finery and running around the halls rather than sitting inside the sanctuary. This made me feel at home. I also noticed that the stairwell railings had little knobs on them, to prevent kids from sliding down them. This also made me feel at home. Kids are kids, whether they speak Russian, Hebrew, or English! I got up to the third floor and entered one of the largest sanctuaries I’ve ever seen. Click here for Parts I, II, III, IV, V, VI, VII,VIII, IX, X, XI, XII, XIII, XIV and XV. Back in my hotel room, I seriously contemplated skipping the Friday night experience at Chabad. Frankly, the process of showering early enough so that my hair would dry on time, but then not being able to nap because my hair would dry all flat from the pillow, seemed overwhelming when I was so tired and just wanted to sleep. I'd heard that Russian women dress really nicely and always wear makeup (which was true, from what I‘d seen so far) and it felt like too much effort to make myself look good, shlep to the Chabad house, and then pray and eat and talk to people. The opportunity to just sleep all evening was tempting. In the end I decided that I'd have to go with wet hair, and took a nap first. Part of the reason I wanted to go to Chabad was to see how this particular slice of Jewish Moscow looks, and to meet people who actually live in Moscow. I wanted the cultural experience, one I'd never have a chance to experience again. But what truly compelled me to pull myself together, frankly, was the knowledge that there would probably be roast chicken at the meal. That felt like a simple but wholesome, warm food that I could eat. I have a friend who jokes, whenever she forces herself to go to a social situation that she doesn't want to attend, that "at least there will be cookies." I didn't feel like dragging myself outside, but at least there would be roasted chicken! I love roast chicken. So I napped, and as the sun was going down I showered, feeling bad that I might miss the start of the prayer services; again, I'd probably never be back to Moscow, so this was my only chance to soak in the Shabbat experience here. Then something positive happened: I checked my email one last time, and my friends had sent me my credit card codes! They’d gone to get Wylie’s litter box, and had found my codes just where I’d said they’d be. I didn’t celebrate yet -- I’d have to wait until after Shabbat to confirm the codes actually WORKED in this foreign country, and that nothing else was going wrong -- but this was a step in the right direction. I was 95% ready to breathe a sigh of relief. Shabbat started around 6:40 pm, which is when I left the hotel, in search of the Marina Roscha Jewish Center. Click here for Parts I, II, III, IV, V, VI, VII,VIII, IX, X, XI, XII, XIII, and XIV. At the Jewish Museum, I went to the ticket counter and proudly held out 400 rubles. The museum is located in what clearly used to be a sprawling warehouse, and it has a cool “New York loft apartment” feel to it, with exposed brick walls and all the displays under one vast, airy roof. It is quite large, with lots to see and read; I spent two hour there and by far did not see everything (in particular, I did not see their youth center, nor the “Center for Tolerance” section of the facility). But what I saw was really, really interesting and well-done. Exterior of Moscow's Jewish Museum. Photo from Wikimedia Commons, provided by the museum itself. 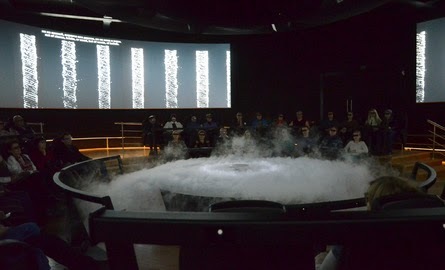 First, visitors go up a ramp into an enclosed theater with large, comfortable seats in concentric circles, with large screens all around on the circular walls. 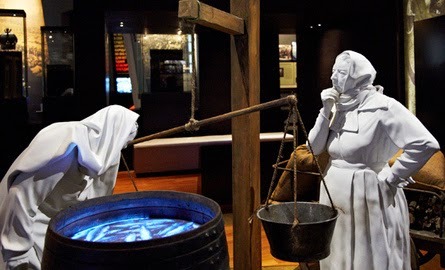 There, the museum shows a film that summarizes the events of the Tanach (the Hebrew Bible), establishing for all visitors, Jews and non-Jews, that this museum is about a people with a long history and a rich heritage, a people that has many stories about itself and that has challenges maintaining their traditions and heritage when they are scattered all over the world. I appreciated that they started with the “positive,” and that they didn’t jump right into something like the Holocaust. In any case, the seats moved around to make it “experiential,” and if you ever go there, be prepared to get wet during the section about Noah’s Ark. Experiential theater-in-the-round about the Hebrew Bible. 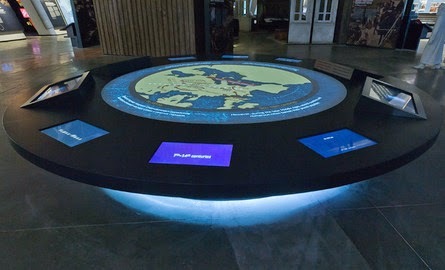 This and all other photos taken from the Museum's website. One then goes out into the exhibits about Jewish life in Russia over the last several hundred years, which go more or less chronologically, though I think at one point I went the wrong way and went through the 1800’s backward. There is also a section on the different Jewish holidays, which I think is a serviceable introduction for people who don’t know much about them, and a section on Jewish traditions in Russia since the fall of the Soviet Union, with photos of families lighting Shabbat candles and such. Wherever possible, the curators clearly did their best to make the exhibits engaging and to use as many senses as possible; for example, in the section on Jewish synagogues and prayer, they have a soundtrack playing of a man chanting Kol Nidrei, which gave me chills because, of course, it’s the same tune they use in every synagogue I’ve ever been in for Yom Kippur. These are MY people! Many of the different eras of Russian-Jewish history were addressed through documentaries, showing real film clips from the times. 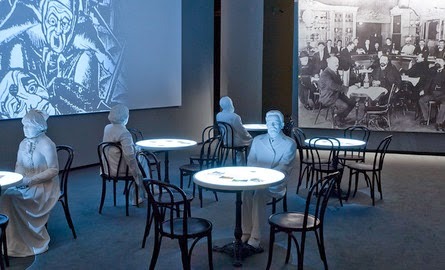 In a section about political turmoil in the early 20th century, there is a “coffee shop” where you sit at tables with various statues (Jewish people) and you can read the newspapers and pamphlets that are on the table - quite clever. Most, though not exactly all, the exhibits came with English translations. Interactive maps of Jewish migration from the destruction of the Second Temple until today. Then as now, urban Jews sat in coffee shops and talked about local politics. The section about life in the Shtetl was very good, although I did accidentally jab my toe into the platform holding up some peddler’s wares, and to this day I have a bruise under the nail of my second toe - an injury I sure didn’t need! But in any case, there were two things I learned about, that I hadn’t realized I was confused about. The museum showed me I’d been confused AND cleared up the confusion at the same time. First, about Shtetl life. I’d always gotten two kinds of stories about it, passed down from my grandmother, who lived in one, and through other cultural exposures such as playing in "Fiddler on the Roof" or visiting Yad Vashem. I realized now that I’d never really understood how it was that the Shtetl was both a sort of Golden Age of Jewish life in Eastern Europe and Russia, and also a place where Jews suffered from anti-Semitism and were poor and had difficult lives. I learned about Shtetl history and lifestyles, and also jammed my toe quite thoroughly into the low platform under this barrel. At the Jewish Museum in Moscow there is a very moving section about the Jewish community’s role and sacrifices during World War II: how many Jews fought for Russia in their army, how many hundreds of thousands of Jewish soldiers were killed, how the Jews in the Russian army fought doubly hard because they were fighting not only for Russia, but also because they had an inkling of what would happen to them if Germany won the war. I had never truly considered World War II from the Russian viewpoint before, let alone the even more specific Russian-Jewish one. Now I understood why, when I asked about the Holocaust at Israeli Absorption Centers, the Russian translators used the word “Catastroph” to refer to the war. FYI, the gift shop at the Museum has some nice knick-knacks, but all the books were in Russian. No English. 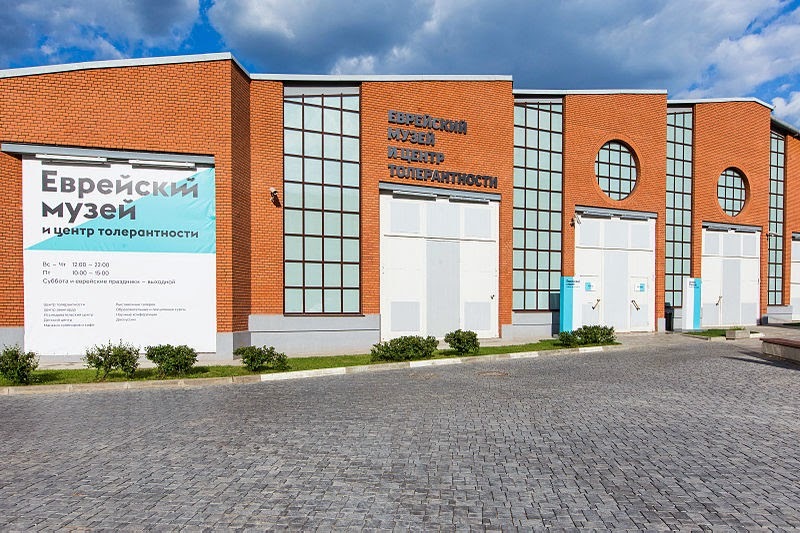 In this case I think that’s fair, since the museum really is marketed more, I think, toward non-Jewish Russians than to international tourists, though I do highly recommend it to visitors. It‘s a truly excellent museum. Next to the gift shop is a kosher café that looked like a nice quiet place to sit, with all that exposed brick and all. 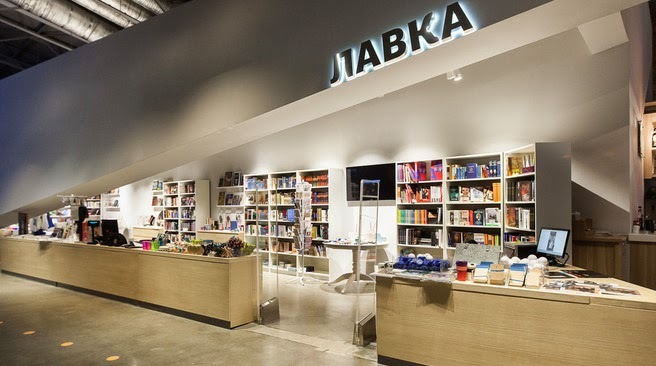 The Jewish Museum store has little to offer English-speakers, but is otherwise very respectable, with many books in Russian about Jewish culture and history. On my way out of the museum two interesting things happened. First, I saw what clearly was a Chabbad rabbi leading a group of teenagers through the museum. Finally - someone who speaks Hebrew! The teens looked like it was a secret thrill to have an American stranger talking to their rabbi in Hebrew, and it really is very cool when you think about it. Anyway, he confirmed for me that yes, the synagogue where there would be communal Shabbat meals is quite nearby, and did I know that in addition to the Israeli table, there would be, this week, a Shabbat table set aside where the language would be English? I said I’d certainly keep an eye open for it! He also showed me that the kosher grocery store, Pardes, was just a block away. Second, I checked my email (thanks, free museum wi-fi! ), and found that the friends taking care of my cat were having a difficult time. The cage I’d bought for him turned out to be very easy for him to escape. He’d almost jumped out the open window of their apartment. They had made a makeshift cover for the pen, but still, he had found a way to escape from underneath. The tin of litter that the vet had recommended using was not adequate and they were planning to go to my apartment to get the litter box. Meanwhile the cage was full of litter. And Wylie seemed unhappy, “brooding,” and they didn’t feel they could devote the time he needed to interaction and affection. He wasn’t eating and they were basically force-feeding him wet food and his painkiller. Perhaps he’d be better off at a shelter? I promised I’d try to find an alternative solution for him, because if they were specifically asking about putting him in a shelter, it sounded like they were very overwhelmed by the intensive care he needed, and I’m not the sort of person to just leave my problems dumped on good folks who are overwhelmed by them. I told them that it’s OK if Wylie is brooding as long as he’s safe, and I know they are doing their best and I have confidence that no one could be doing better than they were, but I’d try to find a new place for him. I posted on Facebook that I’m looking for solutions for my cat, and then walked home. Shabbat was starting soon, and I still didn’t have my credit card code, and now my toe hurt and I needed to find a new place for my cat to rehabilitate. But at least I’d finally seen a Moscow attraction, and it had been one with personal meaning. Click here for Parts I, II, III, IV, V, VI, VII,VIII, IX, X, XI, XII, and XIII. Everyone warned me that the weather in Moscow would be terrible. That’s why the plane ticket is so cheap, everyone pointed out; who else is crazy enough to go to Russia at the end of February? “We hope you have a good coat,” they said. Well, I do have a good wool jacket, in fact, and I wore many, many layers, and gloves, and earmuffs. And between the coat and all the layers and the gloves and the earmuffs, I was perfectly comfortable. Most of my trip, the temperature hovered just at zero degrees Celsius, or one degree below, during the day. That’s pretty cold . . . but it was sunny, and there was no wind. The absence of wind makes a huge difference. The fact that my boots were extraordinarily uncomfortable for long-term wear was a much bigger problem than the weather. Click here for Parts I, II, III, IV, V, VI, VII,VIII, IX, X, XI, and XII. I woke up at 11 am, feeling incrementally better than the night before. At least I was headed in the right direction, albeit slowly. On my way out of the hotel, I purchased access to the internet for the day, emailed Jerusalem to exert some more not-so-subtle pressure on my friends to go to my apartment and get my PIN code for me, and then headed for the supermarket I’d found next to the money-exchange place the day before. My first order of business, now that I had some cash, was to get toothpaste. All this time – since I’d arrived a day and a half before – I’d been brushing with water to protect my teeth, and gum to protect my breath. I would have traded my kingdom for some Colgate. While looking for toiletries, I took the opportunity to examine grocery prices here in Moscow. The store was long and narrow, so I had to walk the entire length of it before I found the dental items at the other end. I picked up a banana and some milk, and looked around at the prices on produce, meat, packaged foods, and dairy products. 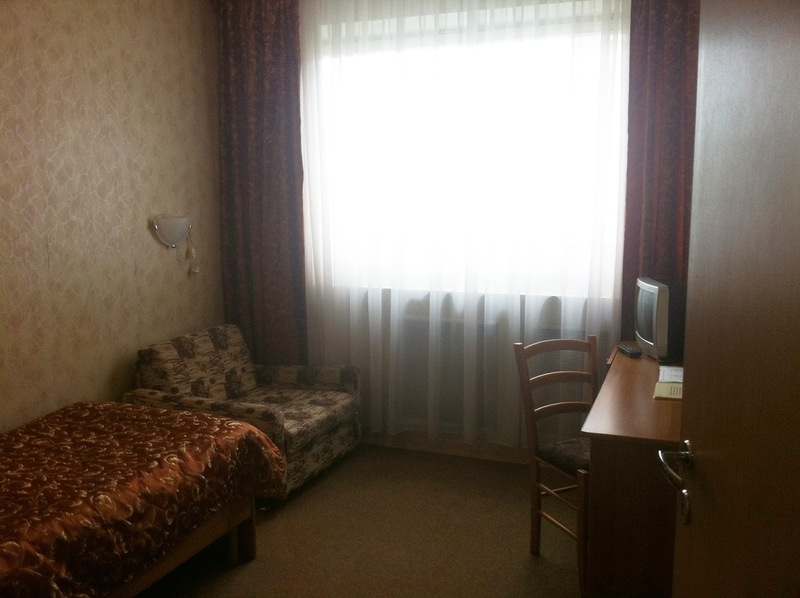 Many people had told me that Moscow is an expensive city, but I found the prices here to be quite reasonable. The prices on the food were certainly no higher than in Israel, and in most cases a bit lower. Of course, everyone knows that food prices in Israel are ridiculous. By the way, it appears that Russians, like many Europeans (I think?) are not in the habit of using floss. There were about four different kinds of toothpicks, and many brands of toothpaste and mouthwash, but no dental floss. Also, by the way, trying to mime dental floss to store employees feels rather ridiculous. When I went to pay, the cashier swiped the toothpaste and the milk, but not the banana. She didn’t speak English but motioned that there was something missing from the banana. I figured out that here, you are supposed to weigh the produce in the produce section, get a sticker with the price, and then bring it to the cashier – they don’t weigh it at the cash register. I felt bummed that I didn't even know how to buy a banana in this place, but did recognize that not having a banana was a much higher-order problem than the ones I'd had the day before. You live and you learn. Weigh produce first. Know your PIN code. Pack your own dental floss. OK.
Now that the shopping was done, I had time to see a tourist attraction. I considered going to the Matrushka Doll Museum, but with Shabbat coming, and my still feeling woozy, I figured it would be smarter to stay closer to the hotel. The Matrushka dolls would have to wait until Sunday or Monday. Next stop, just a few blocks away: The Jewish Museum and Tolerance Center.